Hello everyone, and welcome back to The Arcane Sanctum. I hope you all are doing well, and I want to thank you all for taking the time to read these articles. This is the most I have produced in a single month since I started writing about MTG years ago so it has been quite an endeavor. For those of you just joining us let me catch you up on what has happened so far. In part 1 of this series I the topic was the cards that were banned from Standard on January 15th when the most recent Banned & Restricted announcement was released. I also talked about the impact feedback from the community has on changes in design, and how that could have led us to this era where cards seem to be frequently banned in Standard. In part 2 of this series I the topic shifted to Magic: the Gathering’s recent past where we all were witness to a deck so oppressive that other decks that come close to it’s level are now measured against it, and often times (as we saw with the announcement) met with bans. Discussion also led to how the game changed to mirror another card game, and the aftermath of that summer as well as that era’s impact today. 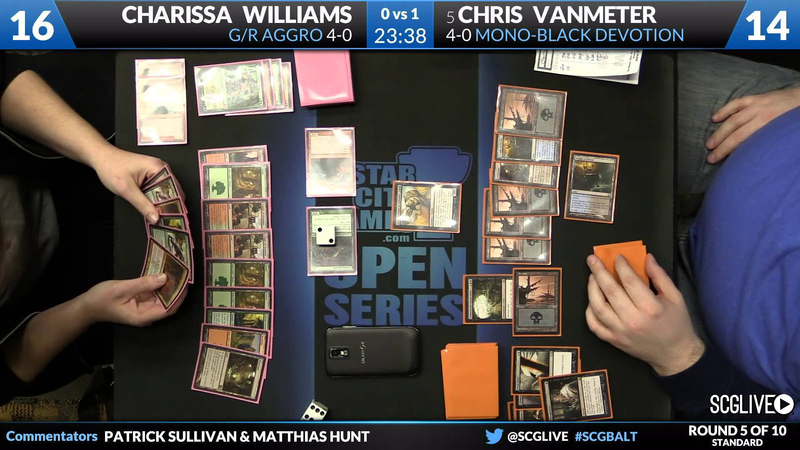 In part 3 of this series the topic then pivoted outside of Magic: the Gathering to show how the competition can cause Wizard’s of the Coast to adapt, and change their strategies to stay on top of the CCG market. Some of these competitors have also influenced current card design, as well as marketing strategy (which I’ll touch more on today). Over the last year there have been more cards banned in Standard than the last 6 years combined, and as we look at that time frame card design seems to shift to the point where creatures are far better than spells, and this level of design has impacted nearly every format. Once creatures become too powerful there has to be change (by banning), because in order to tip the scales back in the favor of spells then one would have to inject powerful spells back into Standard. Doing that hastily could cause everything to become out of balance, and it would be difficult to regain control. All of us, collectively, have had a hand in the direction this has taken the game. While there has been some good come from it we need to understand how we got here in order to find a way to return to a balanced game that we had years ago. Up Next On SportsCenter: Magic? ESPN, the worldwide leader in sports coverage, was looking to draw into a younger audience in the mid-to late 90’s. The quickly growing popularity of Magic: the Gathering seemed like a perfect opportunity for them to gain such an audience. Magic itself was in it’s infancy at the time, and after only 3 World Championships under their belt in 1997 the two joined forces to bring the game to a wider audience. Appearing on the channels (then new) ESPN2 network viewers got an inside look into Magic: the Gathering’s World Championship, US Nationals, and other high level events. Unfortunately after after the World Championships in 2000 the two parted ways. However that did not stop us from seeing high level play. Taking to the internet coverage of the game’s highest level tournaments continued in earnest. Showcasing many players, some of who would go on to become names in the community themselves, players got to stay up to date on the best strategies as well as memorable plays. One of which even became known as “The Top Deck of the Century”. It’s pretty amazing. Here we have two players near the end of the match, and the tension is high. One wrong decision can cost the entire match, and make you the one that (maybe) no one remembers. Lightning Helix played an important role in this match, and I can’t do it justice. You’ll have to watch. It’s moments like these that capture interest from the viewer to not only play Magic, but also try to do well enough to attend these events. The desire for players to play in high level events, and maybe get on camera, would soon be provided through another outlet. In part 2 of this series I mentioned how the Caw-Blade era seemed to coincide with the rise of coverage from StarCityGames. Their Open Series (now just an SCG Tour) provided players a high level tournament above the FNM experience, but perhaps just a tad less than the GP experience. These also happened a lot more frequently than the premiere events from Wizards of the Coast. This was not only a great way to promote the game to viewers, but also provided access to the game from those interested in playing through a medium common to those who game. Twitch is THE place to watch anything gaming. Video games, card games, and even D&D. Viewership is very important, and viewers can interact directly with the show via a live chat. The easy access (especially now on mobile devices), and interaction brought a lot of popularity to the site, and with that traffic interest in the various games (and the streamers) on at all times of the day. While all of this attention was great for the game there was something that was caught by those who design the game, and that was how those new to Magic understood what they were seeing. How does he win again? The year? 2014. The player? Ivan Floch. The deck? THE DECK! Azorius Control! To me this was awesome. We had access to not only all of the Return to Ravnica & Theros blocks, but also Magic 2014 (came out before Theros) & Magic 2015. Have you watched the match? I linked it in the image above, but take a look at Jackson’s face in the image above. The Azorius deck played very little in the realm of threats during the first game so when a viewer tuned in if they did not know the game (or the current meta) they would not have an understanding why one player had an advantage if the player (in this case Jackson) was the only with permanents but considered losing. This led to Wizards of the Coast wanting to get rid of “un-fun”, and “feels bad” moments, and the beginning of the extreme focus on getting new players as well as an over-focus on Standard (and for at least a solid year JUST Standard) in terms of constructed play. Now this particular match was not the sole cause of this, but the culmination of everything we have talked about so far has led to this issue with design. Wizard’s wanted to cater to new players, players who maybe were introduced to card games through Pokémon or Hearthstone (ESPECIALLY Hearthstone). Design became focused on creatures, and started to focus on more Midrange play as well as making sure the card pool allowed to player to play their cards without concern it will be immediately removed. Let’s take a look at some recent cards that have been made that show the change towards this sorcery speed, or larger cost instants, that is currently happening now. Here we have cards from each of Magic’s primary colors where the card on the left was truly a fine card, and the one on the right was designed as a way to provide “fair play” that was “easy to understand”. The cards on the right were also designed for a “creature first” type of constructed play. When Magic design feels that Pacifism, that was truly in Standard as of Dragons of Tarkir, is “too good” for Standard then I feel we personally have a big problem with this current era of design. While a lot of this has focused on Standard if you pay attention to Modern & Legacy (especially with the printing of Leovold, Emissary of Trest) a lot of decks seem to be focused on creature combat. DRAFTING TAKES FOREVER! Seriously, Drafting takes a long time. You have to draft 3 packs, AND THEN play a match. From a coverage standpoint, and focusing on the “new player” or someone who has not played yet, this can be difficult to understand. It could also lead to those being uninterested in this as there is no action right away when tuning into the middle of the Draft. The other thing that many miss is that usually 3 weeks after a new set comes out the Draft environment is solved already. The focus also goes towards Standard (and perhaps other formats), and this focus on design to Draft first over Standard honestly seems to be a waste. Why would you want to spend so much time, and money, on developing a new product where it’s primary reason for design is unwanted (or forgotten) so shortly after it’s released? Players will buy the singles they need, the desire to play anything but Draft dwindles, and then the set sits on the shelves of stores wasting away (until a holiday sale, or something similar). So how does Wizards of the Coast try to keep interest in buying their product if booster packs are not bought? With more product aimed at new players of course! With the removal of the Core Sets (which were THE PRODUCT for new players) after Magic: Origins we not only lost out on evergreen cards that helped develop balanced deck strategies, but we also were given way too many products to purchase. From Commander pre-constructed decks, to Duel Decks (which are ending this year for another product), as well as sets like Unstable our wallets were getting thin. Products aimed at big box stores (WalMart, Target, etc) such as the (awful) Magic Gift Box, and Booster Battle packs also seem to signal marketing throwing ideas at the wall and not caring that they stick or not. Notice how none of them are instants? Or even sorceries? When creatures are pushed this hard it’s no wonder why there had to be bans. When there seems to be a fear to provide needed spells to counter these creatures they are left to either roam free, or sometimes creatures are designed to counter another archetype that was not legal when it entered Standard (see Rampaging Ferocidon). So now that we have looked at all of these factors what can Wizards of the Coast do to bring balance back to the game? Well in a span of 25 years one would hope that they would look at cards that are fair, balanced, and evergreen then keep them legal in Standard for quite some time. Cards like Lightning Strike should not be a special thing. It keep aggro from getting out of hand, and while not Lightning Bolt it does exactly what is needed without getting out of balance. Hopefully with returning to Dominaria can provide the spark needed to bring some excitement, and balance back into the game. They have 25 years of lessons to learn from. That’s a lot of good times, good memories, and lessons learned (even if they were learned the hard way). Well this concludes the 4 part series “Something To Ponder” discussing the Standard bannings this month. I have covered several different angles on what has happened, and how we reached this outcome. Will there be another “Something To Ponder” article, or series? Sure. I’m always up to discuss anything Magic related. Next Jace! Ahhh Ahhhhh!! Savior of the Universe!